Sweetheart has all the characteristic flavour elements of a good sweet cherry, predominantly sweet, but not at all sugary, with an underlying hint (no more than that) of bitter sharpness. The flavour is arguably richer than is usual amongst cherries. To get the best flavour, pick when fully ripe and eat immediately. We think all sweet cherries are best when eaten slightly cool, but not chilled. 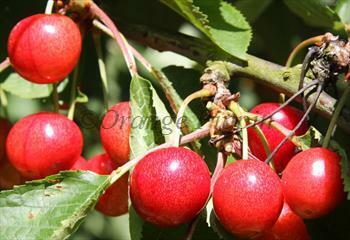 Sweetheart is also self-fertile, and ripens very late in the cherry season - well into August in the UK. Another useful characteristic is that the picking period is longer than most, because ripening is uneven - meaning you don't get the inevitable glut which is a feature of other varieties. Sweetheart® is a protected variety. 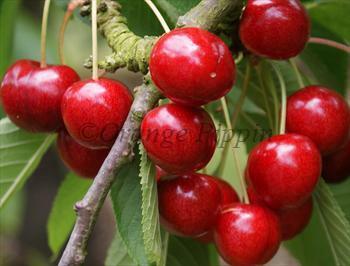 Please fill in the details below and we will let you know when Sweetheart cherry trees are back in stock. Sweetheart is in flowering group 3. Sweetheart is self-fertile and does not need a pollination partner, although fruiting may be improved if there is a compatible tree of a different variety nearby. Since it flowers in the middle of the blossom season it can be pollinated by most other cherry trees. Sweetheart is a precocious sweet cherry, and starts to bear fruit relatively young - you may get fruit within a 2-3 of years of planting, whereas most cherries will start to bear fruit after about 3-4 years. The main thing to look out for is its tendency to set too much fruit after the blossom season (a common problem with all self-fertile varieties). You may need to thin the fruitlets just after the blossom has finished. Sweetheart responds well to thinning, which leads to better flavour and larger fruit size. Sweetheart was developed by the Summerland Research Station, British Columbia, Canada and released in 1990. It is a cross between Van and Newstar.